We have two fully race rigged v15s that are available to charter for $25 a night. This fee includes the boat and registration fees. One of our dedicated fleet members will be present to orient you to the boat and answer any questions about rigging or sailing in the cove. For boat availability please see the charter schedule. If the date you want is taken please contact us. We may be able to find another boat for you to use. For any general questions about chartering a v15 at TISC please contact pstemler@gmail.com . Contact ben.pedrick@gmail.com to reserve a day for your charter. Bring the completed TISC Medical/Liability Release and Registration forms with you. Show up at TISC by 5:30, racing starts at 6:30. The yellow boat is in spot #71. Red boat is in #80. Rig boat, win start, extend lead, have fun sailing, have fun eating, drinking, and hanging out after racing! Can I take the boat out on X afternoon? - Unfortunately the charter boat is only available for Tuesday night team racing and Thursday night fleet racing. One of the dedicated fleet members must be present while the boat is in use. What skill level is required? - Strong experience dinghy sailing is a must. The conditions in Clipper Cove can be quite gusty, if you capsize you should be able to easily recover on your own. Can I charter this boat for the season? - No. This boat is intended to be a short term charter to give people the opportunity to try the fleet out. If you want a longer term charter please contact the fleet captain about possible options. What is the ideal weight for a v15? - Traditionally the answer is 275-325lbs. On a windy night 275lbs will be tough and people have definitely done well sailing at as much as 335lbs. How is the boat equipped? - The boat is well equipped and rigged similarly to top boats in Fleet 53. Is there a tuning guide? - Luther Carpenter has assembled a go fast tip sheet that is a great starting point. What should I wear? - Dress warmly with the expectation that even good dinghy sailors can end up getting wet. 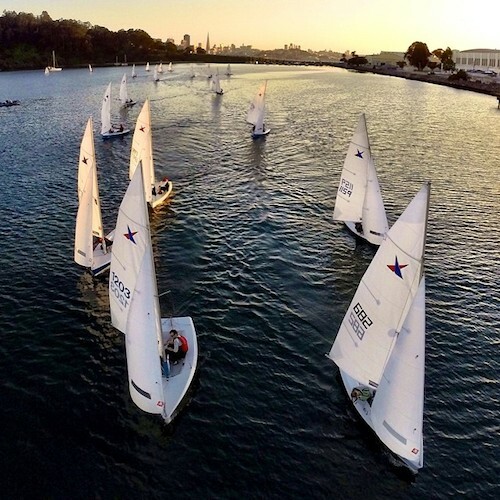 A breeze on night will likely see multiple capsizes in the fleet... Most people wear either 3/4 length hiking pants, wetsuits, or foul weather gear. The neoprene options are preferable if you think you could end up in the water. Here are more details on what to wear. What happens if I damage the boat or lose parts? - The boat is equipped with a bow bumper that should help mediate damage. However, if damage requiring a repair occurs or you damage another boat we expect you to cover repairs. If a line or fitting fails in the course of normal use, please inform us so that we can replace it. Are there any special rules at TISC? - Notably we do 1 turn penalties for fouls outside of the 3 boat length circle, 2 turn penalties for fouls inside, and when necessary resolve protests by 3 minute justice. Are there any additional fees that I need to pay? - No. The total cost of the night including food and beverages for 2 is $25. All launch/regatta fees are included in the cost of the charter. When do I become liable for social chair/volunteer hours? - Once you have participated in > 3 Thursday nights in a season per the NOR you are expected to contribute to volunteer/social chair duties.